As most of my followers have figured out, I am passionate about socially-minded businesses. One such business is a local favorite of mine, Indianapolis-based, Achieve. Achieve helps non-profit groups create memorable fundraising campaigns. As much as I admire Achieve’s utilization of fundamental marketing communication principles to help non-profits, I am equally as enthralled with the compelling research that the company shares with social enterprises. For example, on July 18, 2013, Achieve released its annual Millennial Impact Research report that outlined new marketing strategies, which social enterprises can employ to “attract and engage” members of Generation Y. Within this informative report, insights about mobile social media applications were revealed; namely, almost half of Achieve’s respondents actively followed nonprofit organizations on social media sites (p. 13). The report concluded that nonprofits should “think ‘mobile first’ when designing online experiences” (p. 12). 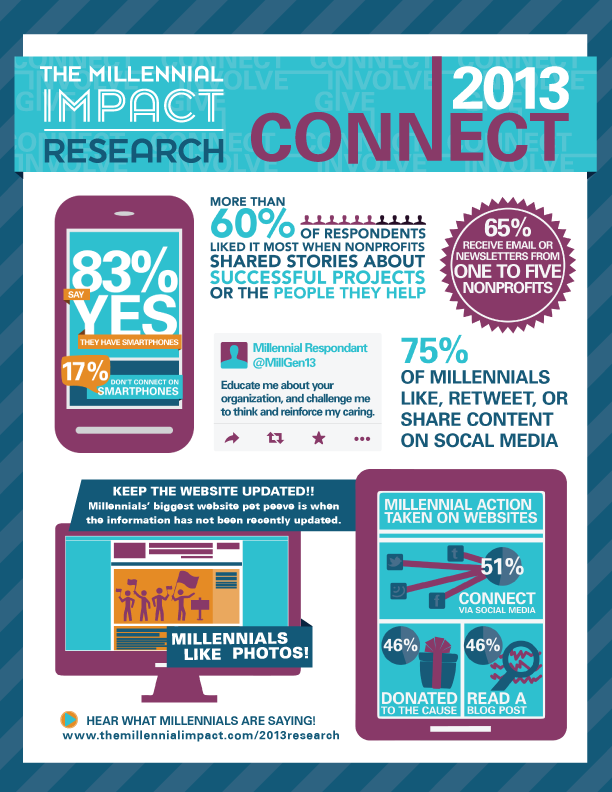 More specifically, Achieve’s study found that making a donation ranked within the top three actions taken by Millennials on mobile devices via a nonprofit’s social media post. Consequently, to increase the likelihood of soliciting a donation, Achieve suggested that a non-profit should incorporate large “Donate” buttons on mobile social media sites, and strongly recommended that the whole giving experience should be as smooth and easy as possible (p. 12). Achieve’s study found that making a donation ranked within the top three actions taken by Millennials on mobile devices via a nonprofit’s social media post. However, Apple’s current ban on donation applications has foiled the attempts by many nonprofits to make the giving experience smooth and easy, at least among Apple users. For example, when users of Apple’s mobile devices click on a “Donate” button within an app on a social media site, the “prospective donors instead are directed out of a nonprofit’s app and to its Web site” (Strom, 2010). In a New York Times article, Beth Kantor, co-author of “The Networked Nonprofit,” explained that “when you’re popped out of an app, you then have to go through a whole bunch of clicks to make a donation…It’s cumbersome and it doesn’t have to be” (Strom, 2010). This social component encourages online group-giving and effectively incorporates elements of altruistic competition. Therefore, while the nonprofit sector has been using social media to reprimand Apple’s shameful denial of charitable donation apps (http://www.huffingtonpost.com/beth-kanter/iphone-apps-donation_b_792069.html), it can now rely on Google’s mobile social media application to expand its donor base. Moreover, Google promises hassle-free campaign planning, which takes “about ten minutes” to complete, and the success and effectiveness of the campaign is measured and reported through Google and its partner Network for Good, which sends the nonprofits monthly project donations. Since Google released the app to US-based Android users on July 11, 2013, it is too early to report any nonprofit’s success stories. However, I will follow this new mobile social media application, which was designed for the nonprofit sector, and report findings as they are released by Google. Strom, S. (2010). Donations Ban on iPhone Apps Irritates Nonprofits. The New York Times. Apple’s got to catch up with what people are asking for. Just as consumers want to be able to shop through an app, they want easy and safe ways to support causes they care about. Good for Google for supporting socially minded businesses and nonprofits (and the people who support them) this way. This brings up a really interesting point about Apple vs. Google. It seems as though Apple “blocks”/denies a lot things. For example, Play Store vs. App Store. Why is it necessary for Apple to approve every app created for the store? I understand it is to be sure that every app created will function properly on the phone, but at the same time, Google offers so much more in the apps, free apps, full version free apps, etc. etc. etc. Apple almost seems to cut themselves short when they perform actions like this. Especially now that they are being perceived as to not wanting to help others by denying “donate now buttons.” It seems very foolish that Apple would risk such a negative view on the company over a quick and easy way to donate some money to a good cause. Unlike most android-based products, Apple does not seem to currently participate in social media channels in a way that allows users to actively participate in shaping its products (i.e., the concept of “embracing the groundswell,” per Bernoff and Li – 2011). For instance, Apple’s social media accounts have been historically “non-chatty.” It is unclear if this corporately designed brand will remain viable to members of Generation Z, who have never known a world where corporations do not listen to their input that they provide via social media. Why do you think Apple does not engage with consumers on social media? Will this hands-off approach negatively affect its brand in the long run, especially among younger generations? Great question. For an company as successful as Apple to have such limited foresight while Google is trailblazing through the mobile industry is a strange phenomenon to witness. Apple seems to be taking baby steps into the wrong direction. With Google Glass almost completely on the market for the masses, smart phones might soon be viewed as desktops and laptops are now viewed. This will give Google the upper hand over all mobile technology and innovation. They have clearly thought this through, as billions of dollars have already been spent on Google Glass. It is the future of mobile technology, and Apple is no where near Google’s progress on this frontier. I found this very interesting as I own and Apple and my other half has a Droid. We are always comparing the apps available and I always come up very short! It seems to me that Apple is almost acting out in a greedy way. The Google market and droid itself offer and encourage others to create apps for use on their products and apple plays very close to the chest, not allowing apps unless they are fully approved by them before reaching the masses. I also found it very interesting that Apple is not participating in the social media frenzy as you said. Not allowing consumers to have a voice in what they would like to see the product deliver seems counter productive to me. I appreciate you taking the time to submit your thoughts here. Whether it is intentional greed or not, I do agree that Apple’s actions in the mobile application world do appear to be self-serving rather than socially minded. Can you think of any reasons why Apple is shunning the engagement side of social media? Again, many thanks for your time. ← Can an Ecommerce Site Benefit from Social Media Games?